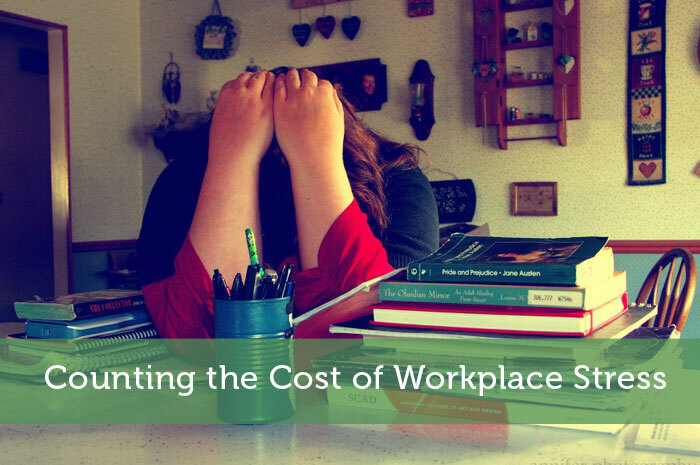 The following is a guest post about the cost of workplace stress. If interested in submitting a guest post, please read my guest post policy and then contact me. Stress seems to be the modern, medical symptom without equal. An abstract noun known and experienced by everyman. A mental condition we can admit to suffering without stigma unlike, say, depression or anxiety, signifying symptoms ranging far beyond any dictionary definition of stress. It forms part of the everyday lexical exchanges among workers. “Hey, how’s it going?” “OK, but bit stressed about this presentation,” or report or meeting and so on ad infinitum. And, it’s commonly recognized as being a habitual guest in our lives whether at work or not. On top of stress from situational working pressures, there’s myriad causes of stress being brought from elsewhere, from the short-term stresses of a falling out with a friend or partner, for example, to the more pronounced stresses such as a divorce, status anxiety, bereavement or addiction issues. Some people thrive on workplace stress. The added pressure resulting in adrenalin being conducted and controlled to get things done, while others drown: unable to remain buoyant and think lucidly. And when it comes to running a business, stress has an exceptionally adverse effect on profitability. In the UK, stress is the main cause of long term absence in the workplace, and the second most common cause of short term absence. Billions of pounds each year disappear out the door in wages, lost productivity and associated time and resource management. And, let’s not forget the social cost too, of the untold misery endured by some people with severe symptoms of stress. This has understandably made many companies receptive to schemes designed to reduce stress among employees regardless of its source. The Employee Assistance Programme, or EAP, is a service typically, though not exclusively, offered by a third party company. Designed with the dual and related purpose of protecting employer profitability and employee well-being, they offer assessment, support and referral services to any employee who feels they need support with well-being, workplace and health issues. Regardless of possibly cynical motivations among some employees of introducing these schemes, i.e. bottom line being paramount over pastoral care, they appear unequivocally a ‘good thing’, reflecting their ‘helping you, helps us’ origins as in-house alcoholism programmes in the States in the sixties and seventies. Critically, they are confidential services. Employees can take advantage at no cost to themselves an array of services from information on well-being to counselling services. In trying to shift the balance from stress related absenteeism to presenteeism, one British company, introduced an Activecare Employee Assistance Programme. Realizing effective intervention was coming often when the stress related absence had become entrenched, the programme intervenes from the very first day of a reported stress absence. This means qualified occupational health professionals can conduct consultations within 24 hours of the absence and swiftly evaluate and refer the employee to an appropriate support service. It’s a sensible step to offer sympathetic help quickly and effectively. When stress has built up so much that someone can’t face going into work, they are usually close to breaking point, where worrying about being off work too is the very last thing they need. The sooner effective support is offered the better for both employer and employee. I’m not surprised that this is a British program. I went to school over there for a year and noticed that you guys are way more on top of it healthcare wise. A friend of mine over there had to see a therapist regularly and she complained that it was a bit of a wait to get on his list, but in the long run it cost her nothing. To me, that always seemed worth it. Even mental/emotional care seemed to be a thing that was at least considered in the workplace in the UK. In America, it feels very fend for yourself. Maybe it’s just me, but while it’s still socially acceptable to say you are stressed here, if it shows in any way as a weakness, it’s still a weakness, no matter what you call it – and would be perceived as such in my workplace. Workplace stress is one of the scariest things to be around and feeling. I know for myself that that is often pretty overwhelming. EAP programs were once very prominent in the U.S. But with the recession, they seem to have been greatly diminished. This is an example of the shortsightedness of many companies. With more attention to employees’ mental health, less absenteeism and more productivity would be the result. My boss and my boss’s boss at my last job created a lot of stress for me. It got to the point that I was sleeping my weekends away (a sign of stress). I did miss work, but not a lot. I participated in our work EAP and it was helpful. Eventually, I decided that the job, nor the people causing my stress, were important and I had better things to do in life. Luckily, I have a support system. Many do not. Over and over, we’ve said that if we hadn’t spent years living below our means and building an emergency savings account, I wouldn’t have been able to quit. For those struggling with work related stress, get your finances in order and take control. No matter how “good” the job is, a job shouldn’t ruin your life.